2013 Chicago Red Guide. Interior of Bib Gourmand rated The Publican in the background. It’s that time of year again. 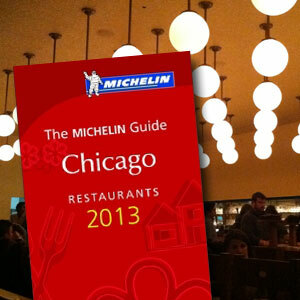 Michelin has just released the latest restaurant and hotel rankings for Chicago. One of the best travel companions in print has to be the Michelin Guide series. It was first published in France in 1900 by the tire company of the same name. What better way to get people to drive around the country on your tires than to provide them with enticing information on touristic activities? They expanded greatly over the next century and last year published 27 of their annual guidebooks covering destinations in Europe, North America and Asia. There are two main categories of Michelin Guide: Red Guides contain Restaurant and Hotel ratings by city, while the Green Guides provide travel and tourism information by country or region. Restaurant ratings are awarded using a system of symbols. The “Bib Gourmand” status is bestowed upon establishments where you can have a great meal at a reasonable price (under $40 per person), while stars or “rosettes” are reserved for truly exceptional restaurants, which are given from one to three. Only three cities in the United States are privileged to have a 2013 Red Guide: New York City, Chicago and the San Francisco Bay area. Michelin inspectors are completely anonymous, have their meals paid for by the company and return to locations multiple times to ensure consistency. Now that is my dream job. If you are traveling to a location for which Michelin has published a guide, definitely put it on your “must buy” list. This entry was posted in Travel Resources, Travel Tips and tagged 2013 Michelin Guides, Michelin Guide, Michelin Guide Chicago. Bookmark the permalink.